Refugees from Africa and the Middle East keep crossing the Mediterranean in rickety boats, ready to give away all their money and risk their lives for the dream of Europe. But the European Union member countries remain divided on the issue of how to handle refugees. Refugees from Africa have been crossing the Mediterranean for decades. But the two disasters off the Italian island of Lampedusa on Oct. 3 and 11, where more than 400 immigrants perished, seem to have hit home. The asylum issue was actually on the agenda of the EU summit held on Oct. 24 and 25. Also, the European Parliament published a press release demanding coordinated efforts and more funds to address the situation. “Lampedusa should be a turning point,” the press release said. Many of the refugees come from war-torn Somalia or the brutal, closed dictatorship of Eritrea, but the civil war in Syria has made the situation even more extreme. On a single morning, the Frontex mission picked up 19 men and a woman, Wikstrom said. Those who have some money pay smugglers to take them across. Swedish Radio (SR) reported this week that 12 people drowned after a boat capsized off the coast of Alexandria, Egypt. The passengers were Syrians trying to escape Egypt, where the current unrest has made it difficult for them to stay. One woman lost three of her four daughters, and the survivors of the shipwreck are now being detained at a police station for attempting to illegally leave the country. Those who actually make it across safely are faced with a rough situation. The main immigration center on Lampedusa holds only 250 people, but when the Epoch Times spoke to Italian lawyer and children’s rights activist Alessandra Ballerini last week, she said that 883 people live there, under harsh conditions. Most of them are sleeping on foam mattresses without a roof over their heads. Many refugees arrive without identification, hoping to be able to get into other countries while EU authorities try to identify them. Italy is not considered a good place for refugees because it’s in the throes of an economic crisis, but under the Dublin Regulation, the first country a refugee enters has to handle his asylum application. In some countries, like Italy, people can face prosecution for abetting irregular immigration if they let refugees land on Italian soil—one of several points criticized by a recent press release by Human Rights Watch (HRW). 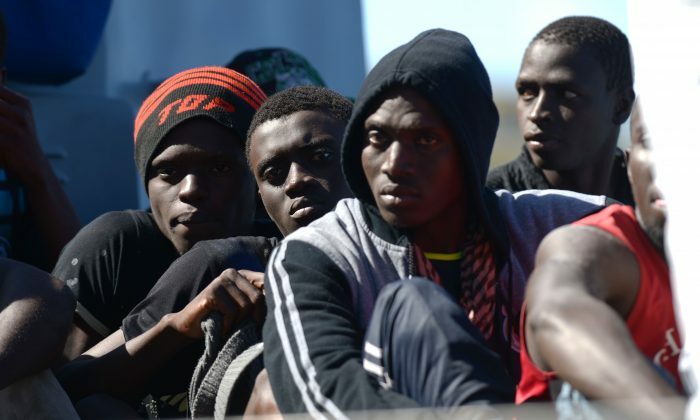 Others are concerned that refugees rescued at sea are returned to North African ports, like Libya, which “lacks a functioning asylum system and has a record of abusing migrants,” according to HRW. That could also lead to “refoulement,” that is, refugees are deported back to their country of origin where they risk torture or persecution. Cecilia Wikstrom is disappointed in the current state of EU asylum policy in general and critical of some member countries. The Syrian crisis has led to a major influx of asylum seekers to the EU. Sweden and Germany account for more than half of the 50,000 asylum applications from Syrians between March 2011 and August 2013, according to the Migration Policy Center. Yet these are but a drop in the ocean compared to neighboring countries, like Turkey, which holds some 600,000 refugees. Wikstrom said that other EU countries need to step up to the plate and accept more U.N. quota refugees. Cornelia Ernst agrees.